Being a single parent is not easy as you alone are responsible for the well-being and safety of your child. Being a single parent is not easy as you alone are responsible for the well-being and safety of your child. While you do everything to protect and provide for your little one, some unforeseen circumstances can pose a challenge. The other day, I received a call from a friend, a single mother to a four-year-old. She sounded worried. She had just had a conversation with a financial advisor and inferred that her life insurance policy was not adequate and that the protection element was lacking. Now, for a person with limited financial knowledge and who was relying on life insurance policy as a key fallback, this was a rude shock. I realized how important this policy was for her, and decided to review it. I soon learned that her concerns weren’t justified. The policy was a child plan with term riders which provided sufficient cover. It even had an accidental death and dismemberment rider plus a waiver of premium rider. I explained to her that these riders were excellent and were adequate safeguards to cover for an unforeseen eventuality. The affirmation came as a big relief for her. This incident made me realize how critical a life insurance policy is for a young, single parent. 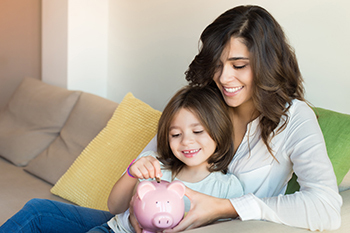 While it is important for each one of us to protect our dreams by opting for a comprehensive financial risk cover, it becomes even more important for single parents as they do not have a spouse to fall back or rely on. Unfortunately, if the parents die in debt, the children might not even get an inheritance, because the creditors come first. So, how should a single parent plan his/her finances so that his/her children do not have to be financially dependent or compromise on their dreams? Here are some ideas. Listing down the various financial milestones for your family, and estimating the financial requirement at each milestone is the first step in financial planning. It requires a careful analysis of the current value of these goals and then extrapolating them by factoring for inflation. Education, career, and marriage are generally the three key milestones for a child. In addition, a single parent also has to plan for expenses towards housing (rent or EMI) and other household spends. Using a careful combination of investments (in the form of regular savings to build a goal-specific corpus), and insurance (to safeguard the goal), is an ideal way to plan. Insurance helps you cover various risks. Examine your life cover requirement based on your financial needs, current assets, liabilities, and investments. Instead of buying a single policy for the highest cover available, match the policy and its benefits with your needs. In your absence, your dependents will require a regular cash flow. While a lumpsum payout to good, your child might not be able to spend or invest it judiciously. Hence, you can consider financial instruments that offer regular payouts for a fixed number of years. Such plans invest the sum assured on your child’s behalf and pay small monthly amounts. Some plans even have the provision of increasing monthly income by a certain percentage (to cover for inflation). Such plans are ideally suited for mitigating household expenses and other compulsive spends such as education, marriage, etc. Amid all the added responsibilities that a single parent has to bear, it's equally important to plan one's own retirement. There are several policies that cater specifically to retirees. Building a retirement corpus by the time one approaches the finishing line is highly recommended. Raising a child as a single parent is not easy. A well-thought financial plan, punctuated with the right financial tools helps you put your best foot forward and protect your child’s future, making him/her morally and financially independent.